Animated Hanging Spinning Rotating Ghost features LED morphing blinking color-changing lights and spooky ghostly moaning sounds. Ghosts have gotten a bad reputation for being lame over the years. This Light-up Animatronic Hanging Rotating Ghost will not disappoint, and is spooky enough for all ages! Easy to set up, this Hanging Rotating Ghost Spirit will provide your own haunted house Halloween home decor with the frights you crave. 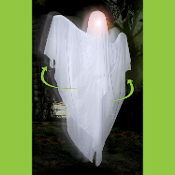 Our LED multicolor morphing lighted eerie ghost will bewitch and scare visitors to your home haunt! Bring your Halloween decorating ideas to life with the perfect noise activated moaning spooky sounds Halloween prop for your haunted house! Approx 63 inches (157.5cm) tall.